We do live in a small village, but it's not like everyone lives in grass huts and runs about naked all day long. Hmmm...although that might make life a bit more interesting. The jungle does have a way of reminding you that it is always ready to take back anything you let it. We still have a few thousand wild elephants here, and there really are still tigers in the dense jungle areas. I have seen some damn big snakes crawling about. We think one of those is what keeps eating the puppies that our neighbor's dog seems to have every other week. 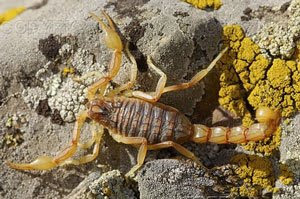 Anyway, today, Roong got stung by a scorpion. It seems to have been feasting in Bongo's food dish, and when Roong went to clean it, it zapped her on one of her fingers. This was a small one, only about 2 or 3 inches long. I called Steve, as I remember him saying that he had gotten nailed a few times since he has been here. He said just to watch it for a while, and if it didn't swell up or anything, then she would be ok. I guess they are like bee stings. Either you are allergic to the venom or you aren't. I wanted to take Roong to the hospital, but she said she was alright. Cobra season is just around the corner...Yippee!